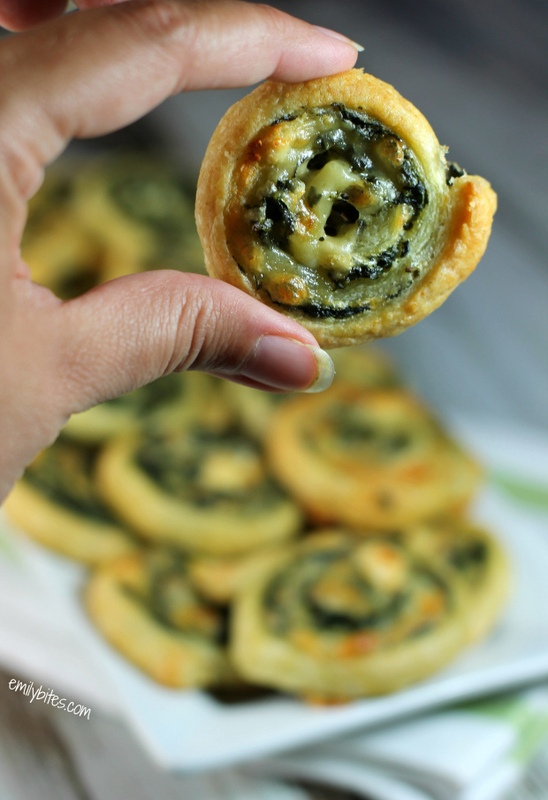 Mmm…golden, flaky puff pastry wrapped around melted cheeses and hearty, garlicky spinach, shaped into cute little spirals? 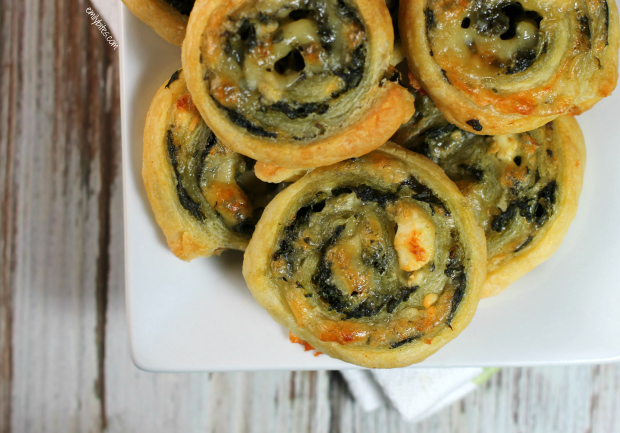 How perfect are these Cheesy Spinach Pinwheels!? I melted, my fiancé swooned, they were a huge hit all around. These cute little pinwheels are a perfect appetizer to serve to any crowd – hungry football fans watching the game, special guests at your next dinner party, or even kiddos straight off the bus from school looking for a snack. You can even prep them ahead of time and freeze them to serve later (you may have to cook them a few minutes longer from a frozen state). Warning: these tasty little pastries will disappear quickly, you may want to make more than you think you’ll need! On a clean, dry surface sprinkle a small amount of flour to prevent sticking and lay down your sheet of defrosted puff pastry. Using a rolling pin, roll the pastry into a 10”x14” rectangle of even thickness. In a large skillet or saute pan, bring the olive oil to medium heat. Add the garlic and allow garlic to cook for about a minute. Add the spinach and stir together. Allow the spinach to cook for 2-3 minutes, stirring occasionally until wilted. Add a couple shakes of your salt & pepper shakers (or to taste). Spread the spinach evenly across the surface of the rolled out puff pastry sheet. 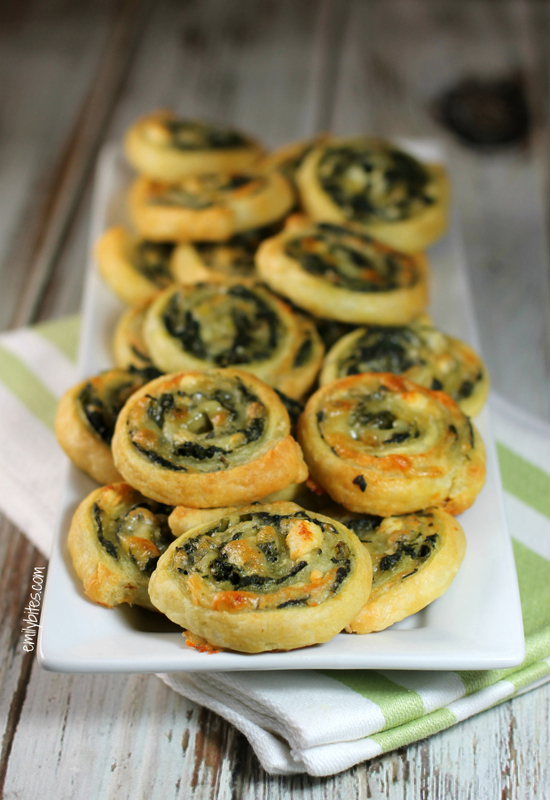 Sprinkle the Parmesan and Feta cheeses evenly over top of the spinach, covering the entire surface of the pastry. With the longer side of the pastry rectangle facing you, roll the pastry by pushing forward, wrapping the ingredients into a long roll. Once the pastry is completely rolled up into a big “log,” wrap it in parchment paper or cling wrap and place it in the freezer for 30-40 minutes. This will make it easier to cut into circles. When you take the pastry roll out of the freezer, use a serrated knife to slice it into 24 even “spirals.” I find the easiest way to do this evenly is to cut the roll in half, then each of those pieces into quarters, then cut each of those pieces into thirds. Place each spiral onto the parchment lined baking sheet and bake them in the oven for 20 minutes or until lightly golden. Serve warm. These look fantastic and I would love to make them for my wedding reception in Dec. Could you give me an idea on how I can make them ahead of time to possibly bake or rewarm just prior to serving? I would really appreciate advice from anyone. THANK YOU!!! Hi Barbara, you could definitely prep them ahead of time. After slicing them into rounds I suggest placing them in single layers between layers of parchment paper when freezing. When baking you may need to add a few minutes if baking from a frozen state. I haven’t baked them frozen before, so I would suggest freezing a few and trying to bake them ahead of time as a test run to make sure they’ll go smoothly on your big day. Congratulations! These just made my Christmas menu. I see the tip about preparing ahead of time and freezing, but could they just be kept in a refrigerator over night? Or do they have to be frozen if prepared ahead of time? They were such a hit. They were done in a minute and I made extra to put in the freezer. Pop them in and they're ready very quickly. I used a mix of parmesan and pecorino (same portions though). Can't wait to make them again. I love that you're using fresh spinach! When you say one puff pastry sheet, how much is that? I’m not in the US so I don’t know if ours are the same. Here they come in 400g rolls. Jess–I looked up the kind of puff pastry she uses and one sheet is about 245 grams. Hope that helps! I’m trying these now but substituting pesto for the spinach and garlic. Eek! Have had something similar and very yummy at Good Thyme in Wasburn,Wisconsin. Hope they turn out. I finally made these over the weekend for a brunch and they were a huge hit! Will definitely be making them for Christmas too. I was a little nervous when slicing them that they were going to be way too small, but they puffed right up and looked exactly like the picture! Easy and quick – loved them! I love your recipe because of added flavor you are infusing – but I would need to make these ahead and just have the pinwheels ready to go when I get home to bake, would them being refrigerated overnight hurt them at all? I’m making these for my vegetarian daughter for Easter dinner. I’m adding sauteèd finely chopped fresh mushrooms and garlic, deglazed in white wine. I’m adding finely grated swiss cheese. 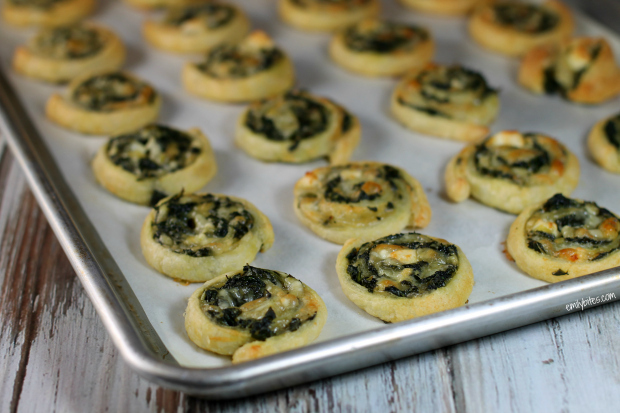 Wilte the spinach, and layer everything up before rolling the pastry….serving with a Swiss mornay under the pinwheels when plating, this is going to kick it up a notch! I hope she’ll like it! I tripled the recipe to bring to a birthday party. They disappeared before *I* could have one! I’ll definitely make this again. Can I add pesto or a cream cheese to this before topping with a pinch feta and Parmesan just to make them slightly creamy or moist in the middle or is this a bad idea? I actually say one sheet of Puff pastry – very different than phyllo dough! You just need one sheet of Puff pastry. I am not sure how much spinach to use that would be 6 ounces. Can I use Mozzarella instead of Feta cheese? Great easy App idea! I will add into my holiday mix! I have a ton of other easy ideas on my site (www.behindtheplates.com) but, these will definitely make this year’s list of things to try! Thanks!!! How do you keep these warm or can they be reheated in microwave? I have a 30 minute commute and would then serve these a bit later, about mid-day. Can’t wait, they look yummy! Thank you!